Globally renowned Carl Zeiss, based in Bengaluru in India, has been showcasing its prowess and contributing greatly to the 'Make in India' concept through its commitment to quality.Here is a look at it journey in India. Founded in 1846, the ZEISS Group is global technology leader that provides solutions for the semiconductor, automotive and mechanical engineering industries along with biomedical research and medical technology. Headquartered in Oberkochen, Germany, ZEISS has representatives in more than 40 countries. In India, ZEISS is headquartered in Bengaluru and is present in the fields of industrial metrology, microscopy, medical technology, vision care and sports and cine optics. ZEISS India began as a pure sales unit in 1998 and has developed into a full scale representation which now includes a software R&D center and two production facilities. The company’s Bengaluru campus comprises a built up area of 140,035 sq ft out of which the industrial metrology segment occupies an area of 39,160 sq ft. In this campus, there are different types of measuring machine models that are manufactured. Managing Director, Carl Zeiss India (Bengaluru) Pvt Ltd, Daniel Sims shares, “ZEISS Coordinate Measuring Machines (CMMs) are produced in the facility. These machines are used for quality control in various industries such as automotive, aerospace, wind energy, infrastructure and heavy engineering equipment industry. It also helps in the production of precise parts with low rejection rates and provides results that can be trusted.” Recently, the company has also started the assembly of two popular models of CMMs called CONTURA G2 and SPECTRUM. The manufacturing sector relies greatly on using authenticated measurement and testing to demonstrate quality and reliability. Globally, ZEISS has been successful in providing solutions to these special quality needs of the industry. Sims opines, “The measuring technology should be a combination of optical and tactile probing in a single machine in order to make the process faster. The strategy of measurement has to be planned well so that the travel time is optimized. The speed of the movement of the measuring equipment is also an important factor. The industry is now working towards incorporating scanning technology where thousands of data points are collected throughout the component.” This is important because of the intricate designs made in the components. For reverse engineering, scanning is a compulsion as well as necessity. This helps in faster inspection cycle time with cost effectiveness. ZEISS CMMs are essential contributors to the ‘Make in India’ initiative— not only are they produced locally but they enable their customers’ to manufacture quality products and compete on a global stage. For the year 2015–2016 (April 2015 to March 31, 2016) the company has dispatched more than 100 machines from its production facility. Some of their key clients, to whom the machines were shipped include: Continental Automotive, Lucas TVS, Indo-US MIM Tech Pvt Ltd, TVS Motors Ltd, TATA Motors Ltd, Minda Corporation, Sansera Engineering, CUMMINS Technologies, Bharat Forge, Bajaj Auto Ltd, ACE designers, Bharat Electronics Ltd, John Crane Sealing Systems, Auto CNC Manufacturing Ltd, PSG College of Technology, etc. ZEISS India has a built in state-of-the-art competence center. 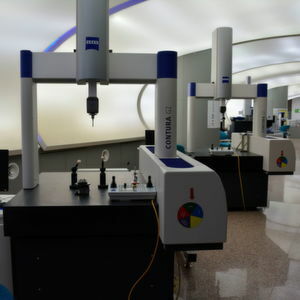 “In this center, various machines and equipment such as CMM’s, roundness testers, surface and contour measuring equipment, non-contact CMM’s, 3D Optical Scanners and industrial CT measuring equipment are demonstrated to prospective customers, thus showcasing the company’s ability to provide solutions to their quality problems,” shares Sims. Certain hi-tech activities of the company’s competence center include: Demonstration on the instruments for customers, component prove outs which play an important role in building up the confidence level of customers with respect to the company’s technical capabilities and converting the enquiry/lead into sales, application training/seminars for customers, software testing and development, service testing, fixture designing and measurement services. A further initiative to get closer to the customer was accomplished when the company inaugurated other Tech Centres in Chennai, New Delhi and Pune, it will also start a new tech center at Ahmedabad.